The officer was identified Thursday afternoon as Officer Reginald "Jake" Gutierrez. TACOMA, Wash. -- A Tacoma police officer responding to a domestic violence call was killed after being shot several times Wednesday night. The suspect was shot and killed by police early Thursday morning after a nearly 12-hour standoff in which police say he used two children as human shields. SWAT officers rescued the children -- a 6-year-old boy and 8-year-old girl (initial reports were ages 8 and 11) -- who were inside the home near East E Street and E. 52nd Street. Police believe they were not hurt but were taken to the hospital as a precaution. It's not clear Thursday morning what their relationship was to the suspect. "One thing I am witnessing over the past evening and day is this outpouring of support from our entire community," said Mayor Marilyn Strickland. "We love our police officers, and we know that every day when they go to work, there's a chance they may not come home. And unfortunately, that happened last evening." Police chief Don Ramsdell fought back his emotions as he thanked the community for their support and spoke about Gutierrez, who was 45 and a veteran of the department since 1999. "He's a model police officer. He's highly dedicated to his profession. He's highly dedicated to his community. And he demonstrated that every day that he came to work," said Ramsdell. Two vigils were planned for Thursday night, both of which drew support from hundreds of people. Officer Gutierrez's body was escorted from the Pierce County Medical Examiner's Office to the Tuell-McKee Funeral Home on Friday by numerous members of law enforcement from throughout the region. The union representing officers in the Tacoma Police Department set up a fund to support Officer Gutierrez's family. Donations can be made at any Wells Fargo Bank branch to the "Officer Jake Gutierrez Memorial Fund," or online at tpcrimestoppers.com. The union's president is encouraging donors to use this fund because he said there were reports of fake online accounts Thursday afternoon. It began around 4 p.m. Wednesday. Ramsdell said animal control officers were called to a home for a report of an injured dog. They came across the suspect's wife, who had been locked out of the home. Animal control then called for backup from Tacoma police and Gutierrez responded along with his partner. The two officers entered the home with the help of the homeowner, Ramsdell said. Gutierrez and his partner went upstairs, which is where Gutierrez was shot multiple times. His partner returned fire then helped get the suspect's wife out of the house. Gutierrez was transported to Tacoma General Hospital for surgery. Police announced his death around 9 p.m.
SWAT moved into the home around 3:30 a.m., but it was a Pierce County sheriff's deputy outside the home who shot and killed the suspect through a bedroom window, police say. "We negotiated through the night. Negotiations failed. We went in. Took one of the kids when we had a chance and (the suspect) grabbed the other kid. One of our officers felt he had a shot. He took it," said Det. Ed Troyer, Pierce County Sheriff's Department spokesman. Ramsdell later said one child was rescued from the porch. The other was rescued after SWAT confronted the suspect. The suspect was later identified as 38-year-old Bruce R. Johnson, II. Kristi Croskey said she was in the home at the time of the shooting to retrieve some items she had left there. Croskey, who moved out of the home about seven months ago, said she knew the Johnson and his wife and didn't know of any problems in the relationship. "I'm caught off guard just like everybody else," Croskey said. 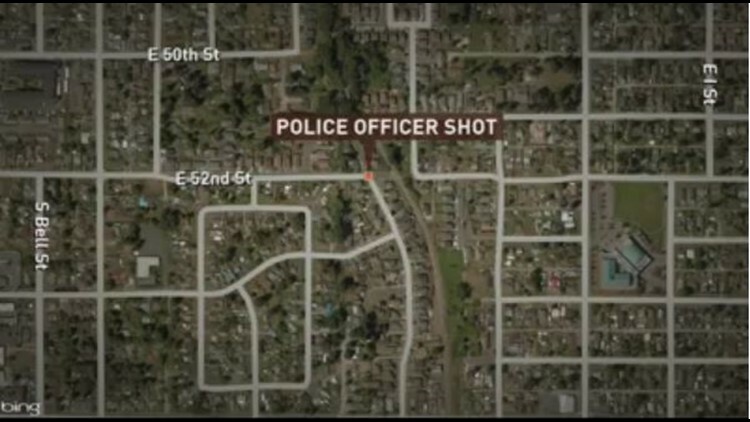 A Tacoma officer was shot near East E Street and E. 52nd Street in Tacoma&#39;s Eastside neighborhood. Sgt. Jim Barrett, Tacoma Police Union president, said the incident highlighted why violence against law enforcement cannot be tolerated. "We choose this profession to try and make a difference. We sign up to help those in need," Barrett said. "In his career, this officer did just that. He made a difference in the lives of those he came in contact with. He may be gone, but he will never be forgotten." About a hundred people came to honor Gutierrez during a procession that left the hospital and went to the medical examiner's office. There was also a large police presence at Tacoma General Hospital, and a chaplain arrived several hours after Gutierrez was transported for surgery. The shooting had an eerie sense of familiarity for some. Tuesday marked the seventh anniversary of the shooting that killed four Lakewood police officers in a coffee shop. Retired Lakewood Police chief Bret Farrar said he hopes the community will be as supportive to Tacoma Police as they were after the Lakewood shooting. Farrar said the public's outpouring of support really helped his department heal. "People wouldn't say anything, just shook our hands or give us a hug. It helped," Farrar said. Dozens of law enforcement agencies and public figures shared condolences for the Tacoma Police Department. King County Sheriff John Urquhart ordered all Sheriff's Deputies to wear mourning bands in honor of the fallen officer. Gov. Jay Inslee said in a statement that the officer's death was a reminder of the sacrifice law enforcement makes every day. "All of Washington grieves with Tacoma, which tonight lost one of their finest," Inslee said. The governor visited Tacoma police headquarters Thursday where a memorial has been growing.